CPC stands for cost per click. You will be paid when people will click your advertisement. The payout varies from few cents to few dollars. That’s how AdSense and contextual advertisement works. They place the relevant advertisement, and you will get paid when people click on them. CPC is determined by the advertisers. In some competitive niches like finance, marketing, online products etc. advertisers may be willing to pay more per click than others. 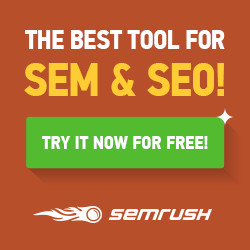 SEMrush is the best SEO tool, because of its great features and how it allowed me to get all of my SEO work done in one place. In just one dashboard, you can get everything done like Keyword Research,Keyword Difficulty,Domain vs. Domain,Site Audit,Social Media Tracker, SEO Ideas etc. Navigate to https://www.semrush.com/ and create your own account here. now enter your popular site in your Niche, like in my case i want’s to get high CPC keywords of howtogeek.com. If you don’t know the simlar sites of your own website just use http://www.similarsites.com/ to find the similar website. Now click on the “CPC” down arrow to get High CPC. As you seen in below image it’s showing me High CPC keywords of this website. Same key you are able to find out High CPC keywords your own niche. Now depending upon your goal, you could select the keywords that drives more money or more organic traffic.it’s always important to understand which keyword is really benefical not only in the terms of money also in the terms of getting more organic traffic. kwfinder :– KWFinder is an easy-to-use keyword research tool bringing perfect keyword ideas.Persoanlly, after SEMRUSH is this is the second tool I use & recommend. Ubersuggest :- UberSuggest is a fantastic free long-tail keyword research tool. With UberSuggest you will not get important keyword details like keyword competition and search volume. This tool is best for generating ideas for your long-tail keyword articles. Long tail pro:- LongTail pro is another paid tool, and it offers many features in addition to finding profitable long-tail keywords.